well, i guess it's been awhile, hunh....? is my new year's resolution to write more ? maybe.... i fully admit that twitter has robbed my brain of it's ability to elaborate on criticisms and witticisms; it's so much easier to tweet "i love lance" than to blog a well thought-out report explaining why i think he's just so awesome. i could say i haven't written in almost a year because life got busier or something, but the truth is i'm just lazy. 140 characters is so much simpler than this. with that said, it looks like i'm easily three rinks behind in my arena reporting, and if anything arena reports are probably my favourite feature on hitthepost. i hit the bell centre last february to watch rene bourque sink his former team with the game's lone goal, then i travelled through a snowstorm to get to nassau to watch reto berra notch his only regulation win as a flame. heck, i don't even think i wrote the arena report for boston from the time i watched iginla's penguins lose the wales trophy in the spring of 2013, or the time i went to watch the sharks beat the leafers last year.... i'll try to get those articles posted in the coming weeks, but i'll start with the united center, as it's the freshest in my memory. first thing's first: chicago is a deceptively large city and the united center rose out of the darkness and the rain in what seemed to be the middle of nowhere. initially i thought we could walk from where were were staying, near navy pier, but in hindsight that was pure lunacy. in the end, we had gone to pre game at the ultimate detroit lions bar, the tin lizzie, to watch some sunday afternoon football ---and the cab to the UC seemed to take forever. 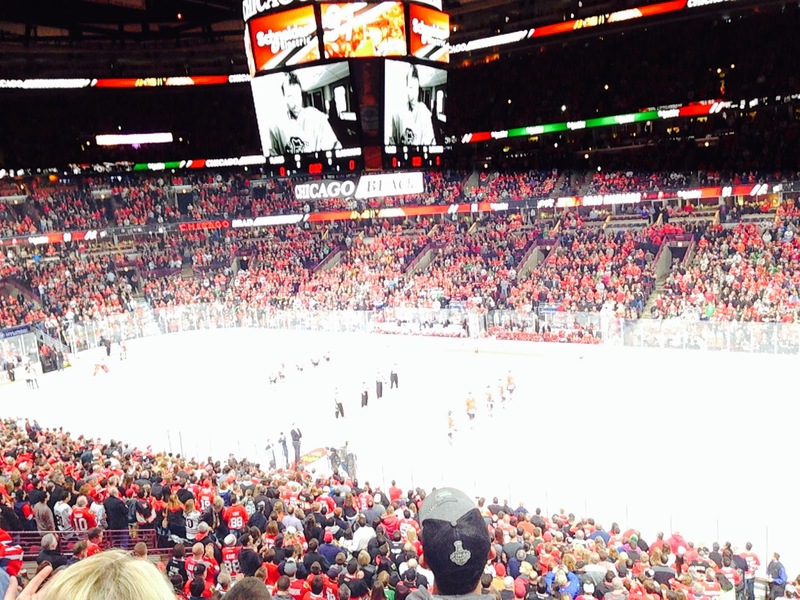 the united center itself is a middle aged NHL arena and it's obvious. it's certainly a step or two above the joe or the dome or nassau in comfort and deco, but while the club level might be carpeted, there's still painted cinderblock walls and old school concessions. it's no warm, homely excel center. the bowl itself is the greatest. it's very open and feels enormous and the famed crowd cheering through the national anthem did provide the electricity that i expected. really something to experience. chelsea dagger, in all it's goal-song glory, was also unfortunately electric. the 'hawks have got that figured out for sure. and, wow. 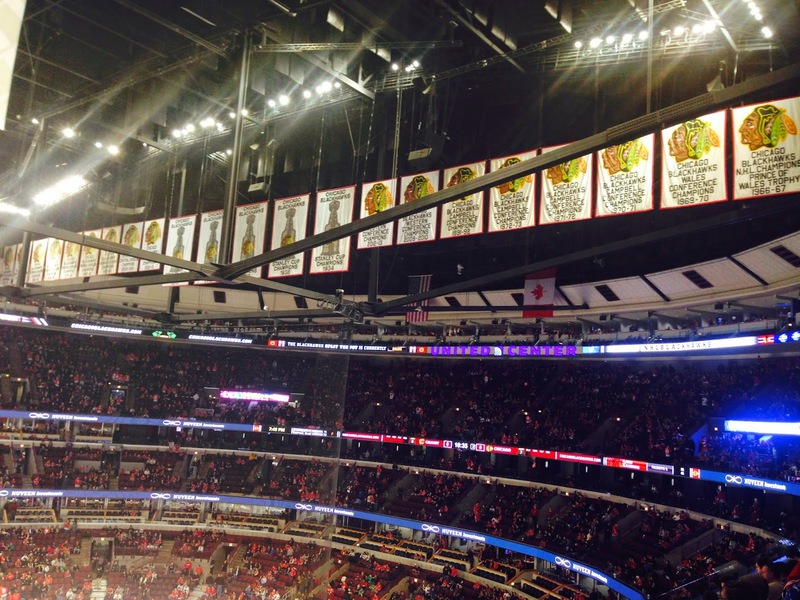 the number of banners an original 6 arena boasts is humbling. the arena snack, properly sourced via a couple of longtimers in the concourse (but also suggested by my companion, zak) was clearly going to be the chicago dog. with the addition of the pickled beans and the celery salt, it's essentially a caesar in a bun. tasty !!!! and of course, anyone who follows along with me in real life knows that htp pal strombo was sneaky and put us on the television. repeatedly. a lot.